We highly encourage you to reflect back on Epoch Wines: Rich Legacies (part 1) to learn about the family, winemaker, and vineyards behind the brand before reading part 2 (below by Lindsey Strawn). This two-part series will provide a better understanding of how one concert pianist, two geologists, two vineyards and lots of history make for a truly awesome story of an award-winning small production winery located in Paso Robles. A huge part of our story at Epoch is about preserving two integral pieces of Paso Robles history. When we purchased our Paderewski Vineyard in 2004, not only did we hit the jackpot as far as soils and views were concerned, we were also buying a property that was once owned, planted, and cherished by Polish pianist and Prime Minister, Ignacy Jan Paderewski. In 2010, we were fortunate enough to purchase the old York Mountain property, which was the site of the first bonded winery on the Central Coast. Besides being total geology nerds (sorry, Mom and Dad), my parents (particularly my mom) are total history nuts as well. To own two properties that boast such rich history is a dream come true, and we make it a priority to preserve and share both the Paderewski and York Mountain legacies through our wines and the Epoch experience. 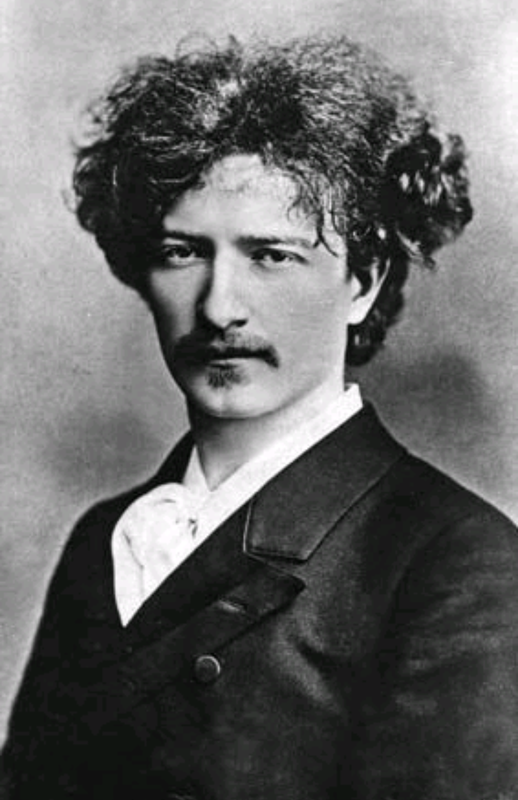 Paderewski’s story in a nutshell: Ignacy Jan Paderewski was a solo concert pianist from Poland, and as crazy as this may seem, he was kind of considered the Elvis of his day. He put on quite a show, and he traveled throughout the world performing. In fact, he was the first solo pianist to ever play Carnegie Hall. Pretty cool, right? Paderewski standing in his future vineyard in Paso. During his tour of the U.S., he was encouraged to make a pit stop in Paso Robles, a small town that might just have the cure to his rheumatoid arthritis in the form of its natural sulfur-rich mineral baths. When not soaking in sulfur (which by the way, did cure that arthritis! ), Paderewski explored Paso and fell in love with its beauty and charm. He loved it so much that between 1914 and 1916, he ended up purchasing 2,846 acres on the west side of Paso. Though he never built a home on either of his ranches, he planted almonds, various fruit trees, and Zinfandel and Petite Sirah vines. As you may have guessed, we now own 577 acres of the ranch where he once planted these grape vines. We were so obsessed with this story that we just had to name the first Epoch vineyard after this impressive man. There is much more to Paderewski’s story, but here are some highlights: in 1918, he helped President Woodrow Wilson create his “Fourteen Points,” playing an integral role in point 13 which established an independent Poland. In 1919, he was appointed Prime Minister and Minister of Foreign Affairs of the newly independent Poland, and he signed the Treaty of Versailles on behalf of his country. Between his departure from politics in 1922 and his death in 1940 a lot happened on the political front in Poland. When Paderewski died, his body received a state burial at Arlington Cemetery per the request of President Roosevelt. Paderewski asked that his body not be returned to Poland until it was free again. In 1992, under the leadership of George H. W. Bush, Paderewski’s body was returned to the free-at-last Poland. Needless to say, this guy was a total stud, and the fact that he found solace and a home-away-from-home in Paso Robles is pretty awesome. We pinch ourselves daily that our happy place was once also cherished by this man, and we are proud to carry on the Paderewski name and legacy through our vines and wines. Old fruit boxes stored in a barn on Paderewski Vineyard that we just happened to find upon buying the property; many of them are original boxes from Paderewski’s winemaking days! Original fruit boxes from Paderewski’s winemaking days holding Epoch fruit in Paderewski vineyard. The York Mountain story in a nutshell: In 1882, Andrew York, a native Illinoisan, who caught the winemaking bug, purchased a 120-acre homestead in Templeton, CA. Andrew quickly expanded the existing vineyard with cuttings from Napa. In 1895, York along with his three sons, began construction on their wine cellar by hauling boulders from the countryside and purchasing the essentials for their new winery. At this point, the York family named their winemaking venture, Ascension Winery, and this became the first bonded winery on the central coast. Again, pretty cool, right?!? Over the next 80 some years, the York winemaking endeavor changed hands throughout the family several times, and the winery saw a few name changes (Ascension Winery to A. York and & Sons to York Brothers to York Winery). Despite those adjustments, the operations ran continuously (even during Prohibition when they were forced to sell simple grape juice), vineyards were planted, the winery itself was expanded using bricks fired on site, and most importantly, their wine was made and enjoyed by the local community. In 1970, York Winery and the surrounding property were sold to the Goldman family. Besides another name change to York Mountain Winery, the winery continued to run without interruption. In fact, it did so until the late 1990’s when the winery itself was forced to close due to retrofit requirements, making it one of the longest continuously run wineries in the U.S. In 2003, the Central Coast was rocked by the San Simeon Earthquake (a 6.5 on the Richter Scale), and the historic winery was officially condemned due to earthquake damage. Though wine under the York Mountain Winery label continued to be sold out of a nearby trailer, this beloved property and operation entered foreclosure in 2009. This sad ending saw a very happy beginning in 2010 when we (my family and Epoch Estate Wines) purchased the property out of foreclosure and began to bring this historic property back to life. While operating our Tasting Room out of a tricked-out single-wide for seven years, we worked on obtaining the permits to rebuild the condemned winery while simultaneously restoring the old York homestead (pictured above with the York family) and building our new winery. Reconstruction on the century old ruins of York Mountain winery officially began in 2013 under the leadership of Lake Flato Architects and B.K Architects LLC. After four years of pain-staking renovation (we literally created our own version of paint-by-numbers with the original bricks and stones, removing and labeling them one-by-one, to then reinstall them in their exact location after reconstruction), we FINALLY opened the doors to the repurposed winery as our new Tasting Room in December! The bricks fired on property in 1906 are not the only elements of this beloved structure that we have preserved. The original redwood beams and the stones from the original cellar also play essential roles in our new Tasting Room. A basket press that was once used by the York brothers now sits amongst the rafters to replicate the original positioning which allowed gravity to bring juice from the crushed grapes to the main floor. Many other original York relics are showcased throughout this building, as we want our visitors to learn about this rich piece of Central Coast Winemaking history that we feel blessed to carry on through Epoch Estate Wines. Oh and I forgot the coolest part of this history chapter! 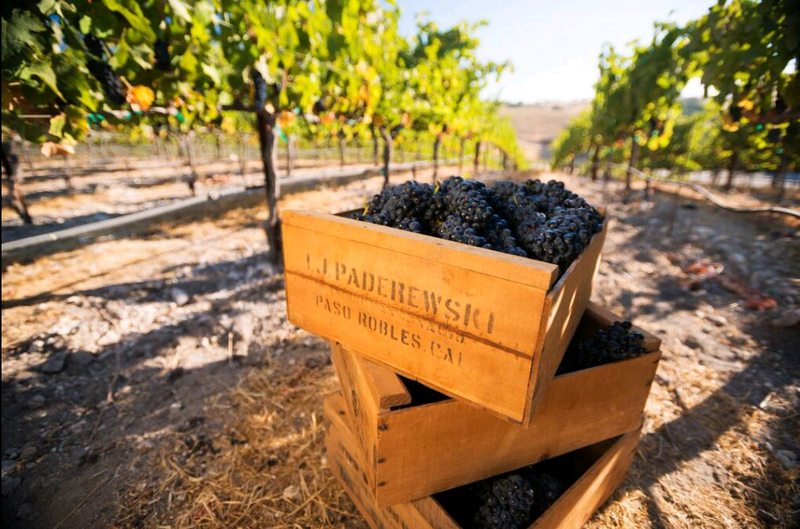 The two pieces of our legacy story, Paderewski and York, collided in 1934 when Paderewski brought harvested Petite Sirah and Zinfandel grapes from his vineyard to York Mountain to be turned into award-winning wine by the York Brothers. Once again, how cool is that?!? We have come full circle as we now bring fruit from Paderewski Vineyard to York Mountain every harvest to be crafted into wine. It’s just Epoch wine now. We take our job of being historians for Paderewski and York Mountain very seriously. We like to think you can taste this in our wines and are able see it come to life when you visit us atop York Mountain! Ok, so if you are still reading this (I warned you, we have a LOT to tell), the bottom line is that we want drinking Epoch to be an experience unto itself. We call these Epoch Moments. That experience can be at home: we hope sipping on a glass of Block B and enjoying its unique chalkiness inspires you to close your eyes and picture the calcareous soils of Paderewski Vineyard. Or that this same bottle challenges you to cozy up with Jordan’s VINPRESSIONs to see how the wine dancing across your tongue is a living, breathing piece of art. That Epoch experience can be taken to the next level upon visiting us, something we sincerely hope you will do soon! Sipping on a flight of our wines while sitting in a building that boasts bones from the first bonded winery in the Central Coast is something pretty special. Let’s not forget that the juice you will be drinking is from fruit farmed on a property that was once farmed by a Polish Prime Minister and the Elvis of his day. And if drinking our wines does none of the above, that’s ok too! We just hope it leads to something super fun and memorable, an Epoch Moment unique to you! With that, we invite you to come visit us soon to see all of these forces in action! We are open daily from 10 – 4, and while walk-ins are welcomed, appointment are strongly encouraged! We hope to see you soon! If you are interested in joining our Allocation Waitlist for our biannual wine releases or buying a few of our wines now, you can do so here. And in case you didn’t get your fill of information here, our website is chock-full of more details about Epoch, our wines, Paderewski, York Mountain, and believe it or not, much more. Thanks so much for taking the time to learn more about Epoch Estate Wines! Cheers!